« Is the Zune doomed? I feel like I am cheating on my wife. I’m listening to music downloaded from the new Amazon MP3 store — in iTunes and on my iPod. Years ago, before the iTunes Music Store, I dreamed of a time when I could download music from any online store and play it on any digital music player. 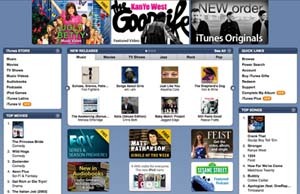 Online music stores were rare then, but then Apple opened the iTMS in April 2003 and downloading legal music took off. At the time, I was forced to deal with digital rights management (DRM) that said I could only listen to iTunes music on an iPod. Apple offered the best digital music players and a pleasant online music store experience, so I turned to Apple, the iPod, iTunes, the iTMS, and simply endured DRM. Even so, I’ve always wanted my music DRM-free, so I could use it on different devices, and share it with my daughter and wife. Apple said no, I can’t do that, so the music in the family remains crippled, tied to different user accounts, and a pain to share. That all may change now that Amazon has opened its DRM-free music store, Amazon MP3, which offers a stout 1-2-3 combination for music downloads. 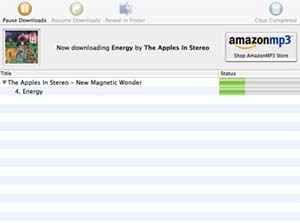 Now I can purchase music and listen to it on any PC, Mac, or Linux computer using iTunes or almost any media player software. Better yet, I can listen to the songs on any digital audio player — an iPod, one of the Creative Zens, a Zune — and I can share them with the wife and kid. So, naturally, a day after Amazon MP3’s opening I had to see how it compares to the iTunes Music Store. What I found didn’t really surprise me: Amazon MP3 is, for want of a better word, very Amazon-y — it’s familiar to those who shop at the online mega-store. MP3 is, like the iTunes Music Store, remarkably simple to use and it offers pretty much everything iTunes does, only in its own, Amazon way. Here’s what I like and dislike about both online stores. After downloading music from both sites, I’m conflicted. As a loyal user of the iTunes Music Store, I want to continue shopping there. But for the first time I have legitimate options, and they are powerful ones not to be dismissed by Apple. What is so appealing about Amazon MP3, so intoxicating, is its 1-2-3 punch. DRM-free music, at a lower cost, that I can share. That combination may outweigh any negatives Amazon MP3 has now, no matter how loyal one might be to iTunes. Report: iTunes still leading music store in the U.S. Funny, you have expressed exactly how I feel. Ahhhh…if only we could have the best of both worlds! I love my iPod and have no desire for a different player, so that’s not an issue for me, but still it’s nice to feel so free AND the price is right! I’ve already downloaded three albums from Amazon and frankly the only time I’ll be buying from iTunes is when the album isn’t available at Amazon. As a loyal Mac using Apple fan, this is the first time I’ve been persuaded away from iTunes to download songs…I think this is really gonna fly! 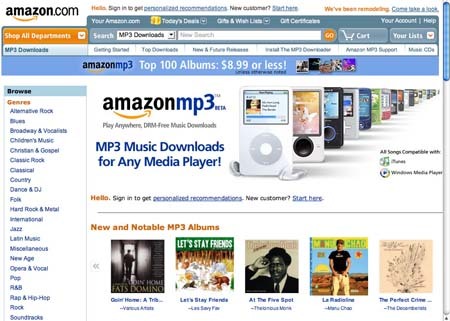 I tried Amazon MP3 as soon as I read about it, and for me the pros well outweigh the cons. It’s so easy to use with iTunes that I don’t need to go back, and I’d imagine 99% of the time the 2.3 million songs will cover what I need. Finally, some real competition to iTunes! Unfortunately, if you live outside of the US, you can’t use AmazonMP3. If you are one of those unlucky people, there is a site that searches several non-DRM music stores at once: http://www.songboxx.com. You’ll certainly find a store that will work for you.